What is a Governor’s School? CBGS is an academic-year Governor’s School program, which means that it offers supplemental coursework during the school year to high-ability high school students. This allows these students to delve deeper into a particular field of study, with targeted, small-group instruction. 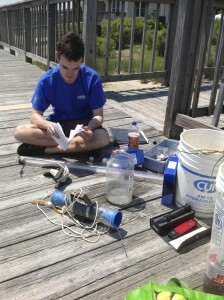 A two–year research project is required of all Chesapeake Bay Governor’s School students. Below is a timeline of the research project development process. Students learn elements of scientific research, including the research method, experimental design, and graphical and statistical analysis. They practice these techniques by conducting several cycles of actual research as an entire class in the lab and on field studies. Students will generate null and alternate hypotheses, collect data via random sampling, and statistically analyze actual data. Students will also read, discuss, and evaluate primary literature, as well as scientific papers from previous CBGS students’ projects. Students will propose a research question related to marine and/or environmental science that they wish to tackle through individual or small group research, along with a brief discussion of relevant theory and a review of primary literature. Once a student has chosen a topic, they will participate in a workshop on locating appropriate literature sources, be assigned a faculty advisor, and receive feedback to streamline their proposal. 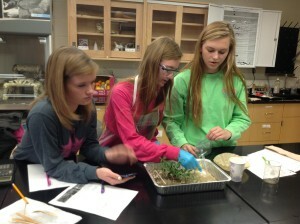 Students will complete experiments and data collection. They submit their raw data by mid-September for preliminary evaluation and troubleshooting. All data collection is completed by the end of October. Students will work on analyzing their data, both graphically and statistically, and write a formal scientific paper summarizing and discussing their research. They will participate in a workshop on technical writing and the format of a scientific paper. The first drafts are submitted by Thanksgiving with a cycle of faculty feedback, and the final drafts are submitted by mid-January. Students participate in a workshop on public presentations, focusing on the use of PowerPoint and graphics, and have practice sessions with faculty for coaching and feedback before their research presentations. Students will publicly present their research at the annual CBGS Marine & Environmental Science Symposium. Faculty and guest judges evaluate the presentations and choose award-winners in each category.